A gardener has decided to down tools on his working life at the age of 104. Jim Webber has been working the land in Dorset for 93 years, without taking holidays, but arthritis has forced him to retire. Mr Webber told BBC news: "I'd do about 10 minutes and have to sit down - I couldn't carry on. That wasn't fair for the people I was working for." The keen gardener, from Stoke Abbott, said he now planned to focus on his own garden and sell some of his produce. Mr Webber said: "I haven't got a big wage now coming in, do you see - I've only got old age pension, so I'll try and sell a bit." Born on Christmas Eve 1902, Mr Webber began his career as a farm labourer in Dorset, and won prizes for ploughing. 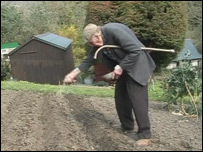 In gardening, he worked with his brother Jack, until he died at the age of 95 in July last year. His daughter, Kathleen, 68, now helps him with his home garden. Mr Webber carried out hedging, mowed lawns and other gardening jobs for residents of Stoke Abbott, as well as mowing the lawn of the local pub, the New Inn. Richard Ward, landlord at the New Inn, said: "The only reason he's retired is he can't get up on his tractor to bring the lawnmower down. "He's amazing, a really amazing character." Mr Ward's partner, Mary Shiels, added: "We inherited him [Mr Webber] with the pub, he'd come around and do whatever he felt needed to be done. "He was disappointed to let us down, but it was time enough really - a well deserved rest." Mr Webber said he had never taken a break: "I've never fancied a holiday, never fancied one. "I'd rather stay and knock about at home or whatever than go on holiday." He puts his longevity down to having "plenty to do and being interested in it" - as well as a bit of his "medicine" - whisky.